Make, Play, and Discover with Nintendo Labo! Simply have fun making DIY cardboard creations called Toy-Con, bring them to life with the technology of the Nintendo Switch™ system (required; sold separately) to play games, and discover the magic behind how Toy-Con works. Express your creativity by customizing Toy-Con projects with your own color, stickers, paint, and more. You can even invent your own Toy-Con! Use pre-cut cardboard kits to build your own remote-control car, fishing rod, 13-key piano, or toy house, with easy-to-follow interactive instructions included in the Nintendo Labo software. After the making is complete, the kits come to life. 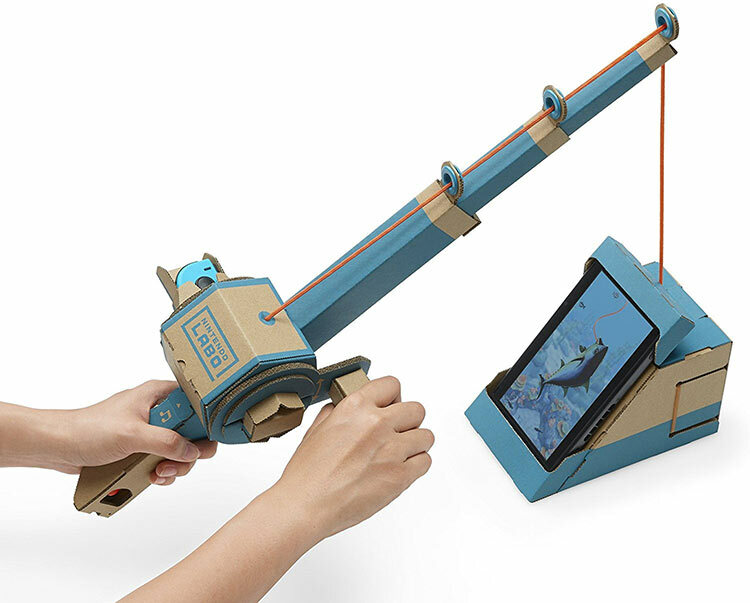 Insert a Nintendo Switch Joy-Con™ controller into your Toy-Con to interact with the Nintendo Labo software in a variety of games that will have you catching fish, racing on a motorbike, or playing music on a piano. 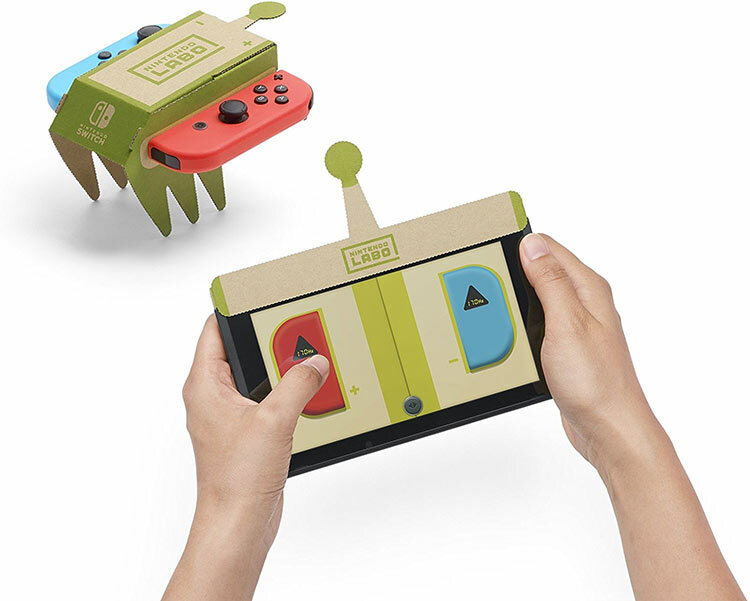 Nintendo Labo lets you explore your curiosity to discover the mechanics of how each Toy-Con works and interacts with the Nintendo Switch technology. Find creative ways to customize your Toy-Con creations and invent new ways to play with Nintendo Labo! The Variety Kit includes six different projects to Make, Play, and Discover: two Toy-Con RC Cars, a Toy-Con Fishing Rod, a Toy-Con House, a Toy-Con Motorbike, and a Toy-Con Piano! Nintendo Labo might seem like a gimmick - and it is, to a certain extent - but there’s far more it than at first meets the eye. It’s a collaborative concept as rewarding in its construction as it is in its final result (much like any LEGO build you’ve ever worked on), and one that utilises every facet of Switch’s DNA in a way only Nintendo could pull off. 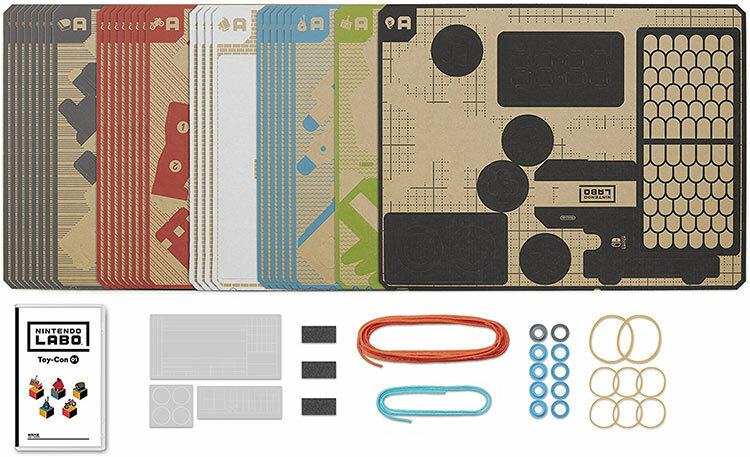 Nintendo Labo Toy-Con 01 Variety Kit shows off a lot of what makes Nintendo great: charm, ingenuity, and undefinable Nintendo magic. However, the Variety Kit feels like more of a tasting than a full-course meal; without a hook to have gamers come back after the cardboard is built, it is hard recommending a purchase of the $70 kit. The Nintendo Labo Variety Kit is a solid introduction to the world of Switch-powered cardboard craftables. It may get a bit tedious and repetitive during its laborious building and simplistic play sessions, but the creative freedom it allows once you dig a little deeper is truly something extraordinary. The magic of Labo is in building of each of the complex cardboard toys. For an average adult, the building process can be tedious and mind-numbing, though never too challenging. But the building and playing experience with a child can take on an entirely fresh dimension. 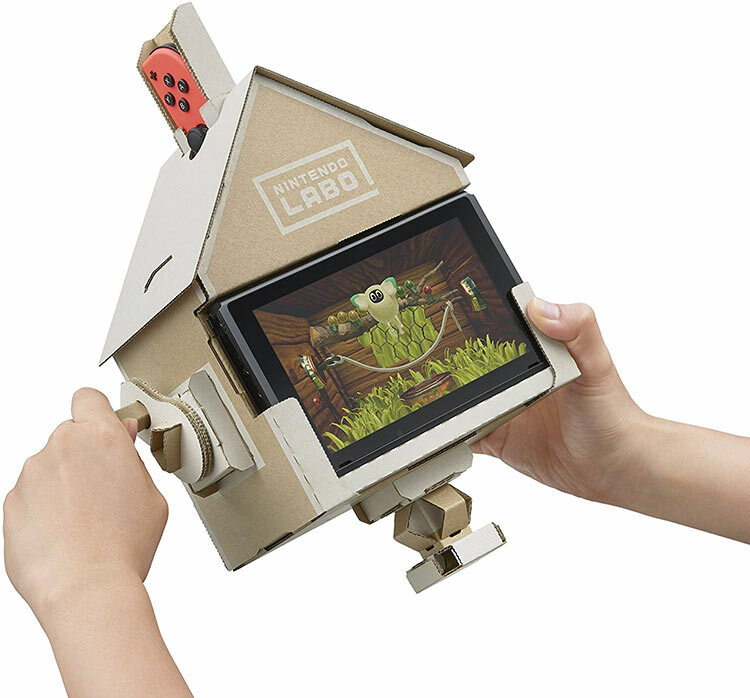 I personally think Labo can breathe a bit of life into 1-2 Switch, adding compatibility with and perhaps even utilising Labo’s creation tools to let users basically create their own mini-games. As the tech advances and Nintendo goes back to the lab, I think we will continue to see Labo grow. I am keen to see where this goes. By playing games you earn different treats to feed the inhabitant, which ends up changing its color and fur pattern when eaten. There are nine mini-games within the house and while no one in particular will keep you occupied for too long, it is fun to discover the combination of attachments needed to unlock them. 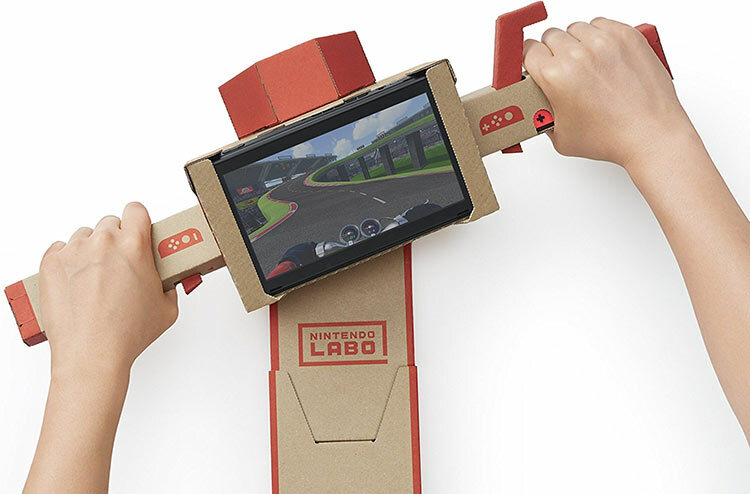 I'd love to see more of Labo coming down the line, in the form of new kits and even cooler ideas as the year wears on, but I'm still reeling over what a great job I did getting through it all and running the gauntlet with its debut products. If Nintendo can tweak the included games to make a more substantial set of electronic components, Labo will evolve into a near-perfect experience. The adult in me is totally here for that. The kid in me, however, just wants more fish to catch. There are a few “experimental” things you can try to build and design via the “Secret Garage”, but none of it really seemed interesting enough for me to bother with. The Nintendo LABO Variety Kit has some fun and satisfying aspects to it, but it lacks any real longevity. And now I’m faced with the ultimate dilemma – where the heck will I store all these cardboard projects now? 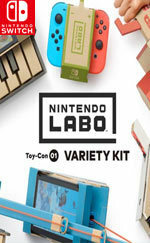 The Nintendo Labo Toy-Con 01: Variety Kit is just what it says on the tin - one that serves up a variety of unique and interactive toys to build. Through a brilliant interface and robust card shapes, the kit offers hours of DIY building fun - with an interactive pay-off. The mini-games are somewhat short, leaning more towards concept pieces, but with the Labo Garage included, it creates limitless possibilities to explore and invoke a little mischief, too! If you ever loved building Lego, then Labo is sure to bring back that fun and creative enthusiasm you once had for building things. 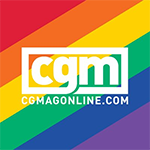 Despite its shortcomings, we recommend that anyone even slightly interested in the concept check it out, especially those looking for something to play with their young ones. 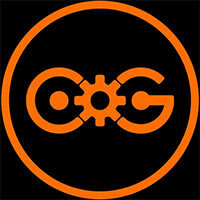 We're looking forward to future toy-con sets as well as seeing what else Nintendo has in store for gaming as a whole. When I saw the Nintendo Labo for the first time, all I could think was, “This is so crazy it just might work!” And it pleases me to no end that, for the most part, it does. Despite some shallow minigames, and the unknown longevity of the Toy-Cons themselves, what it does, and what it has the potential to do (particular in the realm of S.T.E.M learning) outshines the minor flaws it has as a physical product. Auch dort setzen aber Nintendo-typische Beschränkungen wie die fehlende Internet-Anbindung oder die limitierten Speicherplätze unnötige Grenzen. Das Multi-Kit von Nintendo Labo bietet also ein kreatives Äußeres, das aber ein wenig mit seinen inneren spielerischen Werten enttäuscht. À qui s’adresse ce Multi Kit Toy-Con 01 ? Avant tout aux familles qui veulent passer du temps ensemble derrière un jeu aux multiples constructions qui vont s’animer grâce à la Switch. 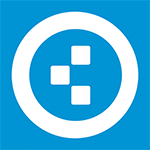 L’intérêt purement ludique des applications fournies est clairement discutable, puisqu’elles se contentent d’expériences strictement fonctionnelles et de courses au score. Labo to doskonała zabawka edukacyjna, wprowadzająca w podstawy programowania, rozwijająca zdolności manualne oraz muzyczne, a także rozbudzająca kreatywność. Dzieciaki nie tylko stworzą coś własnymi rękami, ale też nauczą się, jak działa podczerwień oraz wibracje. Pamiętajcie jednak, że potrzebują przy tym wszystkim nadzoru i pomocy.